One of Narong Prangcharoen’s newest works for orchestra, Raging Fire, describes the various relationships humankind has with fire, from its calm meditative qualities to its devastating and destructive powers. What follows is the fresh, whimsical, and festive flute concerto written by the Romantic Dane Carl Reinecke. 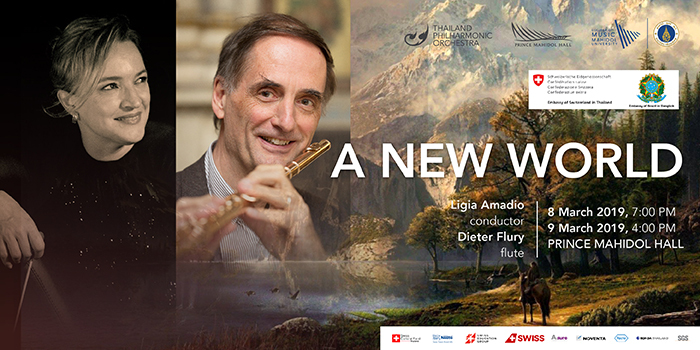 The soloist is the now-retired but legendary flutist of the Vienna Philharmonic: Dieter Flury, known for the atmospheric beauty of his tone and unmatched technical wizardry. Ligia Amadio leads the orchestra in Dvořák’s distinctive evergreen “New World” Symphony. One of Narong Prangcharoen’s newest works for orchestra, Raging Fire, describes the various relationships humankind has with fire, from its calm meditative qualities to its devastating and destructive powers. What follows is the fresh, whimsical and festive flute concerto written by the Romantic Dane Carl Reinecke. The soloist is the now retired but legendary flutist of the Vienna Philharmonic: Dieter Flury, known for the atmospheric beauty of his tone and unmatched technical wizardry. In the symphonic piece on the program Ligia Amadio leads the Thailand Phil in Dvorak’s distinctive evergreen “New World” Symphony. The composer’s extensive stay in the United States served as inspiration for this extraordinary work. Dvorak used Native American melodies and African-American spirituals as musical materials throughout the intense and fun-loving four movements.